There are many amusing details in this picture of Crawley in Sussex. Crowds of drunken people are inspecting the horse and people are leaning out of windows to watch. 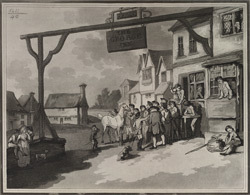 There is a gallows sign for the George Inn, a coaching inn dating to the 17th century. The knotty and caricatured style of the drawing is typical of the artist Thomas Rowlandson.